The Caisse de dépôt et placement du Québec struck a US$3-billion alliance with a money manager co-founded by former U.S. vice-president Al Gore, creating a partnership that aims to make investments that can be held as long as 15 years. The Quebec pension manager’s deal with Generation Investment Management LLP is part of a larger shift toward holding on to private investments for a longer period of time, said Caisse chief executive officer Michael Sabia. Many private equity funds have shorter time horizons and typically begin to cash out an investment between five and eight years after first putting money in. Caisse de dépôt et placement du Québec chief executive Michael Sabia. In an interview, Mr. Sabia said the fund is frustrated with short-term thinking that prevails on many boards and management teams. “We’ve run across CEOs and CFOs who reject growth projects because they won’t benefit the bottom line within 18 to 24 months. That’s just crazy,” he said. The partnership puts the Caisse, one of the world’s largest fund managers with $308-billion in assets, into business with a London-based firm that is focused on investing in sustainable companies, which it defines as businesses that “provide goods and services consistent with a low-carbon, prosperous, equitable, healthy and safe society.” Generation was founded in 2004, four years after Mr. Gore’s narrow loss to George W. Bush in the 2000 U.S. presidential election led to his exit from active politics. The two asset managers announced their first investment on Tuesday, acquiring a majority stake in a digital finance company, FNZ, which valued the company at $2.8-billion and ranks as one of the largest fintech transactions done this year. The Caisse and Generation are buying the two-thirds of FNZ currently owned by U.S. private-equity firms General Atlantic and HIG Capital. FNZ provides back-office wealth management services to approximately five million customers at 60 financial institutions in Europe and Asia; it has 1,400 employees, 400 of whom are shareholders who will continue to own the other one-third of the company. FNZ fits the concept of a sustainable business by dramatically lowering the cost of wealth management, which Mr. Sabia said provides significant social benefits, as it builds the retirement savings of working-class pension plan members and other middle-class investors, along with institutional investors. FNZ founder Adrian Durham said his firm’s technology, along with regulatory changes, have reduced consumer costs by 40 per cent over the past decade. 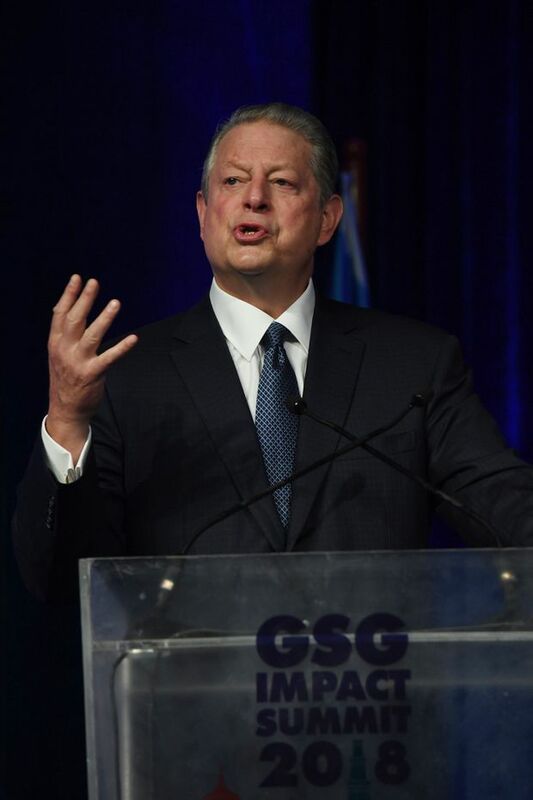 Former U.S. vice-president Al Gore. Mr. Gore is chairman of Generation and plays an active role as a rainmaker for the firm. Outside politics and business, he’s known as the Oscar-winning campaigner against climate change from the documentary An Inconvenient Truth. Mr. Gore is expected to work with the Caisse’s private-equity team to find investments for the new partnership. “We see the sustainability revolution and the technology revolution opening up new opportunities across every sector, including food, finance, energy and manufacturing,” Mr. Blood said. Generation’s past successes include an early stake in home automation company Nest Labs, acquired for US$3.2-billion in 2014 by Google parent Alphabet Inc. Generation has also invested in green energy companies, an online supermarket and Toast Inc., a restaurant software company.